"It's from "miracles," which is his transcendental argument for the plausibility of the miraculous. This is in his section refuting Naturalism." "In his book he takes both the Naturalist and Supernaturalist perspectives and pits them against each other. The naturalist, in his understanding, is one who assumes that everything that exists, exists within a closed system with no perpetual external cause/force--what we would commonly call atheism. In this perspective, reason has to be a byproduct of the evolutionary process, and thus the byproduct of biochemistry of the brain. Thus, thought is simply the meaningless consequence of how atoms line up in our brains. 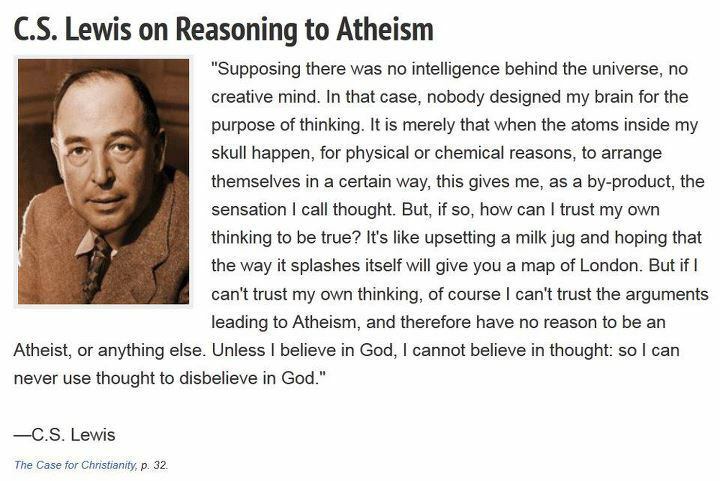 Lewis' claim is that simply because elements line up in a certain way, does not make something true--it requires an inherent order so as to interpret the biochemistry. The inherent order of "reading the biochemistry" is indicative of a design (not his words, but mine)."